First off, congratulations to lucky link up #7, who was picked by Random.org to win my vintage peanut butter parfait dishes giveaway. These will go to DogsMom. She is always looking out for thrifty finds, so I think they'll go to a good home! I've never made whoopie pies before, partly because they remind me of the Moon Pie Incident of 1982, and partly because they seem complicated. But Family Circle magazine had a recipe in their April issue that is so easy - and they turned out delicious! Heat oven to 350*. Coat 3 large cookie sheets w/ nonstick cooking spray. In large bowl combine cake ingredients. Beat on low 30 seconds, then on medium for 2 minutes. Drop by heaping tablespoonfuls onto cookie sheets, spacing 2 inches apart. Bake at 350* for 12 minutes. Let cookies stand on sheets for 2 minutes, then transfer to wire rack to cool. While cakes are cooling, beat butter until smooth. Add sugar, vanilla, and water. Beat on low speed until blended, then medium-high until smooth. Spread a heaping tablespoon of filling onto cake. Sandwich with second cake. How am I ever going to loose weight Lisa when you post gorgeous recipes like this? These look really yummy! Did the boys inhale them? Mmm Mmmm Mmmm! I bet your boys love these! remember how i said i was afraid of moon pies? well. these look less scary. and even maybe i coukd make them! I've never eaten a Whoopie Pie! I'll have to give this a shot. Oh no - I certainly don't need these right now. ;) But I'm thinking I will have to make them for the kiddos! These would be my 10 year old's favorites - Andy is the chocolate hog. These do look yummy! I'm going to show this recipe to Amy and see if she'll make some. Preferably today! I'll have to get some tips re Robin Hood Lisa so I don't have a coronary before hand. And no trying to sway me either on the compo by tantalizing mental pictures of you with knives 'strapped' to your hips like Lara Croft! So, you've been making whoopie! A friend taught me how to make Whoopie Pies before I was married. They were from scratch, and time consuming. These look so easy. I love them! And our local grocery store bakery sells them! Chocolate, white, pumpkin, and I think one other flavor I can't remember. I had to go back and read your Moon Pie story, poor thing!! Cracker Barrell sells moon Pies and they now have two new flavors, peanut butter and mint. They also have double decker vanilla and that's my favorite. I bet your Whoopie Pies are all gone by now! perfect timing!! i was just thinking i needed to find a whooie pies for the twins 1st birthday next week. we're having milk & cookies for dessert but wanted something a little more special for them to eat :) if i do make them, i'll put a link back here as my insipiration. Those look delish - I might make these with Andy. The whoopie pie looks as good as I bet it tasted! I just might have to try those some time! Congrats to DogsMom and Yummy both in this post! Those look so good! Makes me want one but I don't want to bake right now! lol I've made pumpkin ones a few years ago. They were really good! 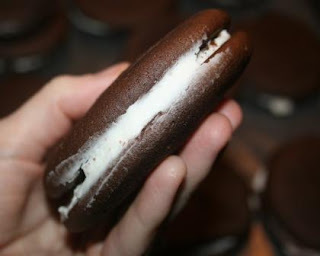 I Love a good whoopie pie... it's a weakness! ... have you ever heard of Wicked Whoopies? Out of this world. Well, actually they come from Maine. The moonpies look very yummy. These whoopie pies are so popular with folks, and yet they are so simple to make. Richard from Amish Stories.